Elec Simon is known around the country for his street-performance style percussion as a former performer with the Broadway production STOMP and current performer and soloist with the Cleveland Cavalier Q-Stix, but on Friday Simon visited Alliance Middle School to give his presentation about anti-bullying. “I’m not here to entertain you,” Simon started off his presentation to students. Students and teachers played 5 gallon buckets as drums and Simon played the bucket drum himself, but most of the program was made up of Simon talking. He had all teachers come out of the bleachers where they had been seated with their classes. He insisted that if he could keep the attention of 1,500 prison inmates, he could keep the attention of a couple hundred middle schoolers, and he did. By starting off talking about respect Simon explained to students in his genuine, no-holds-barred fashion that students wouldn’t want their loved ones disrespected. In the same way, the teachers are someone else’s loved ones and deserve respect from students. At one point he asked what students loved their fathers. When not everyone raised their hands he asked why. Two students offered, answers. One said his father is in jail and another said her father doesn’t come around or call her, even on her birthday. “You just told your story to the whole school and they didn’t have a clue. They probably didn’t know that about you. You use all this energy right now and you go be what you want to be. Attack the world… attack your dreams...keep your chin up and you stay strong,” he told the student. He stressed to students that they often don’t know what others are going through. Some come from good families and others don’t have two-parent support from home, putting them in a more challenging place from the start. “There’s all different shades and forms of people. Some people come from good, some people come from bad. You guys have to accept that,” he said. He asked the students who is bullied and dozens of hands went up. Simon asked one student who raised her hand about her experience and she said she had been told to kill herself by another person before. Several other students in the audience were emotional as well. Simon told a story about his best friend in high school who committed suicide. In his friend’s suicide note, he said, it mentioned that his reason for doing so was that he was bullied. He told the student to never think about killing herself and that she is a beautiful person. School Counselor Katina Parks was a part of getting Simon to the school. She said his style of program was one the students needed to hear. “We needed a more impactful message. Everyday I hear from students who have these issues. People don’t realize what their little comments or actions do to people,” she said. She was pleased after the program that the students opened up to Simon as much as they did. “I think they responded well. So many kids wanted to share their stories with (Simon) one-on-one after the program,” she said. Later in the day one student told Parks that someone who had bullied her last year apologized to her after the assembly. 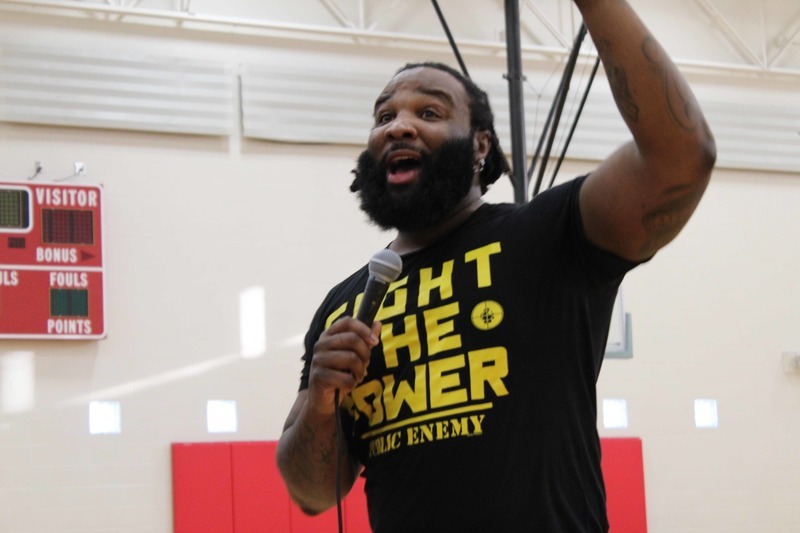 Principal Troy Russell said he had seen Simon give his anti-bullying presentation to Canton City School students when Russel worked there and supported Parks in bringing the program to the Middle School. He said the students received the message well. “I think the students got the message that we are all in this together,” he said. Russell added that the administration of the district is aware that bullying issues are often at their height at the Middle School. “We are trying to be proactive at the middle school. We know about the issues and we want to let the students and staff know that we support them and bullying is not something we will have here,” he said. He gave credit to the two school counselors, Katina Parks and Amanda Scott. Simon challenged school administration to support their staff members, like Parks, who are passionate about helping students overcome issues of bullying. “This woman was crying to me in Panera Bread because she cares so much about these kids,” he said. Parks is one of the leading OLWEUS trainers in the state. OLWEUS is a bully prevention and behavioral management program the school has adopted and implemented over the last few years. It addresses how staff and students should address behaviors that may lead to bullying so that ideally, bullying is stopped before it starts. As a part of the program teachers lead small group discussions and allow the students to express their emotions and process things together on a regular basis. Parks said after the program students returned to class and teachers allowed time for discussion about what students should do with the things they learned from the program and how they might change their behaviors moving forward. Counselors were also available throughout the day for students who wanted to talk more. “I’m hoping it creates change. I want the students to be better today than they were yesterday and better tomorrow than they are today,” Parks said. Mike Luca, a teacher at the Middle School, said the program on Friday was a powerful one. “In my 17 years at the middle school I have not seen a more powerful message presented to our kids. Emotions ran very high, and the message was lovingly stern. There were many tears shed and many hearts touched,” he said. Luca said the way Simon spoke helped to reach the students who have been impacted by bullying. 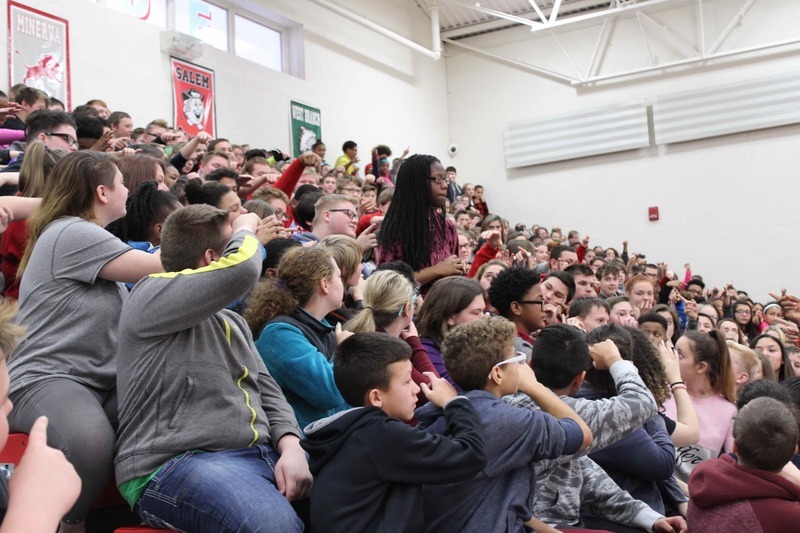 “While he spoke to all students, the focus was clearly on those students who have been negatively impacted by bullying, and on those who choose to take advantage at another student's expense. Those who have been hurt were comforted, and those who prey on others were called to account. After the assembly we had some very productive heart to heart debriefing sessions with our kids. 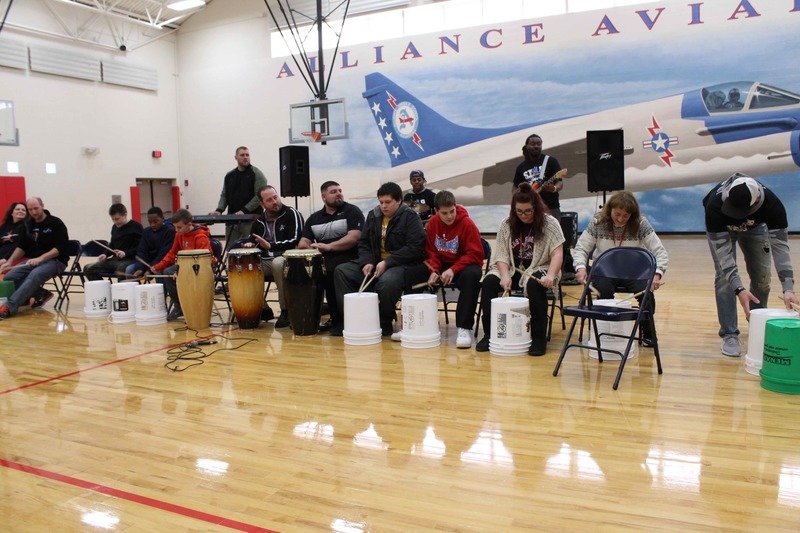 All in all it was a very meaningful experience for students and staff,” he said. After the assembly Simon and the band met with students from the Success Academy. The students have formed a drum line as a part of their music class and discussed their interest in percussion with Simon.